The Barnes & Noble Nook App Store is set to shutdown on March 15th 2016. 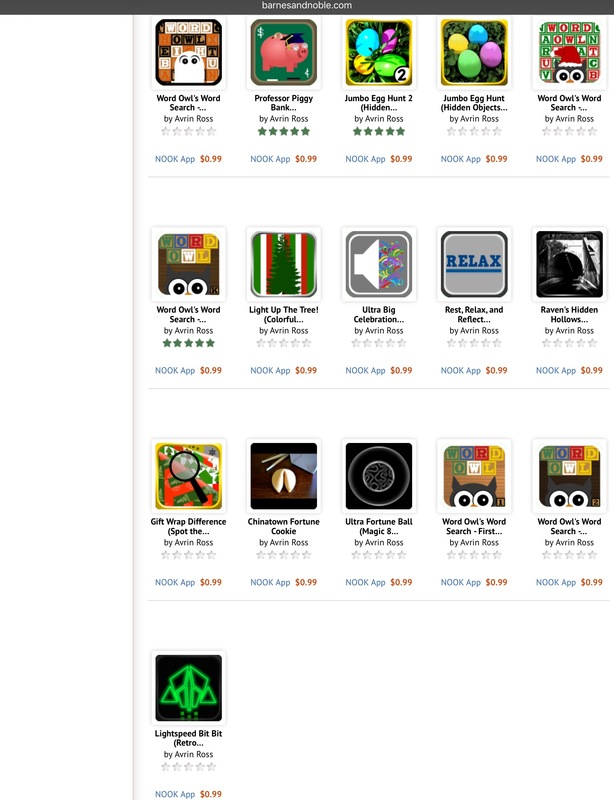 I first made some of my apps available and joined the Nook App Store on March 6th 2013. My relationship with the Nook App Store during those two years was positive overall. There are things that I liked and disliked about the app store, but overall I’m definitely glad I put in the work to release some of my older and new apps on it. 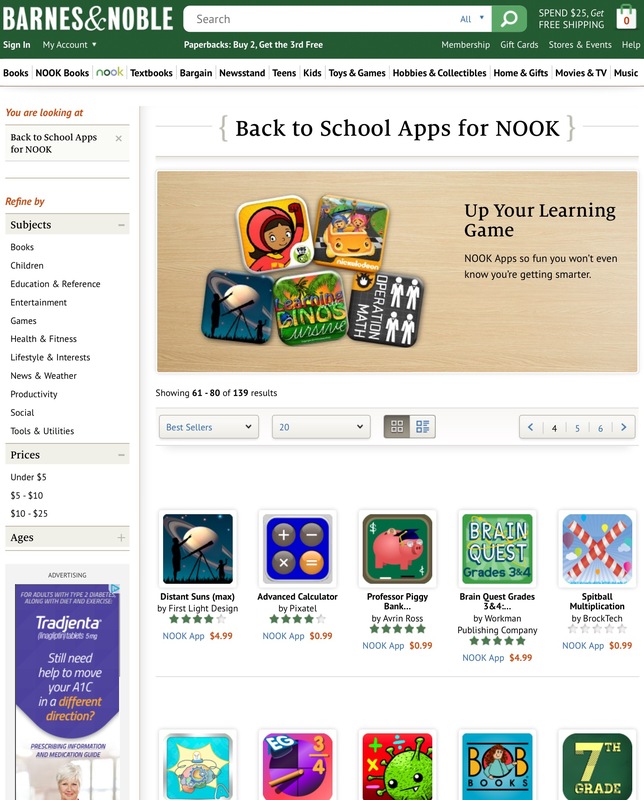 One of the main aspects that I liked about the Nook App Store was its focus on educational apps for children. It was the only app store that had several specific categories for different educational segments like time & money, writing, math, memory, geography and many others. 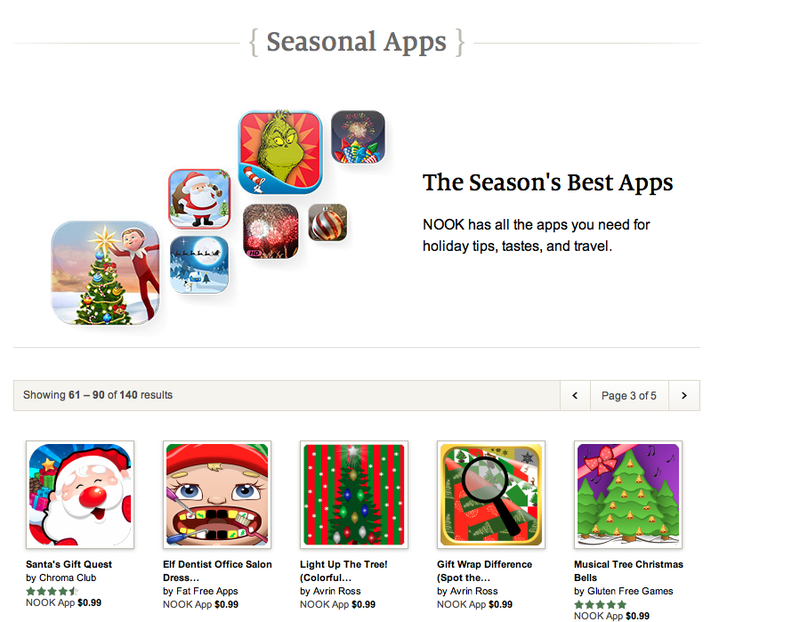 Another thing that I really liked about the Nook App Store were their seasonal promotions were they would let developers submit their seasonal apps for consideration to be a part of a special temporary seasonal section. 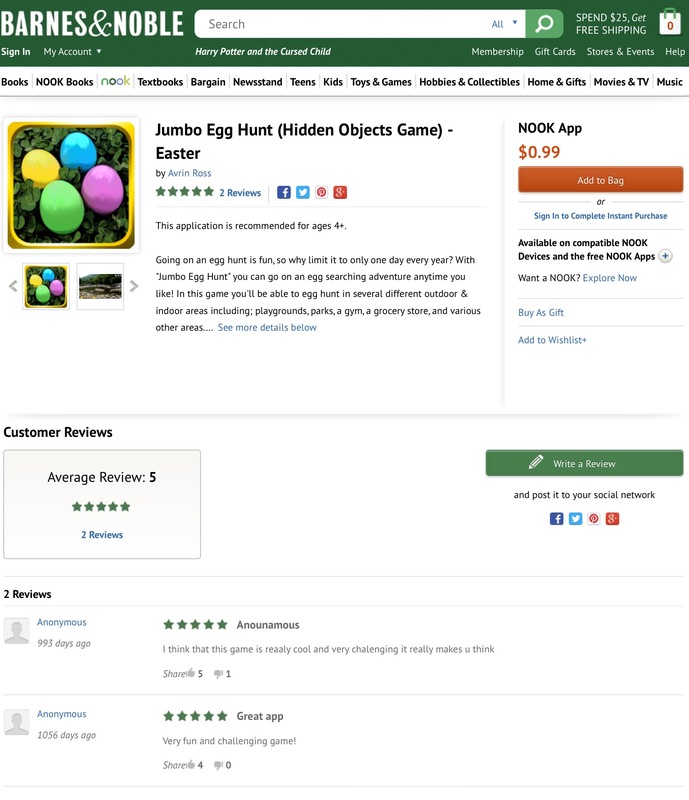 Several of my apps were approved for these promotions in the past and one of them(Jumbo Egg Hunt 2) got extra recognition by being selected for inclusion on promotional banners. I also like that the Nook App Store didn’t have a ton of low quality apps and clones of popular apps that could get in the way of high quality original apps being discovered. It had it’s fair share of those lower quality apps but it wasn’t incredibly overbearing like it often is on other app stores. However, the customer base of the Nook App Store wasn’t nearly as large as the Apple, Amazon or Google Play app stores so even though there was less competition there was also less of an audience to seek. Also, in regards to customer service towards developers. I didn’t have to contact them often but they were nice & informative when I did need to, although not nearly as timely compared to other platforms. Editing/updating metadata wasn’t as smooth and quick as Amazon & Google Play either. 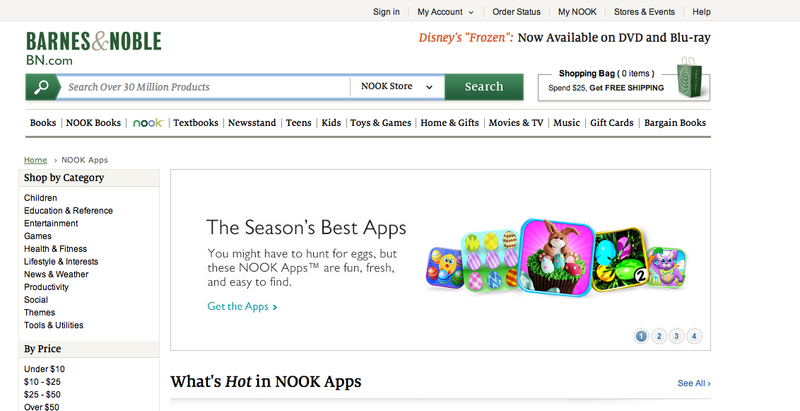 The Nook App Store was never my primary app store, but overall I will miss it. Apple is and has always been my primary app store, with Amazon being my secondary since I joined them. However, in 2016 I’ll continue to focus more on Google Play also which pairs well with the Nook App Store closing since Nook users will be and have been directed towards Google Play for their app needs. 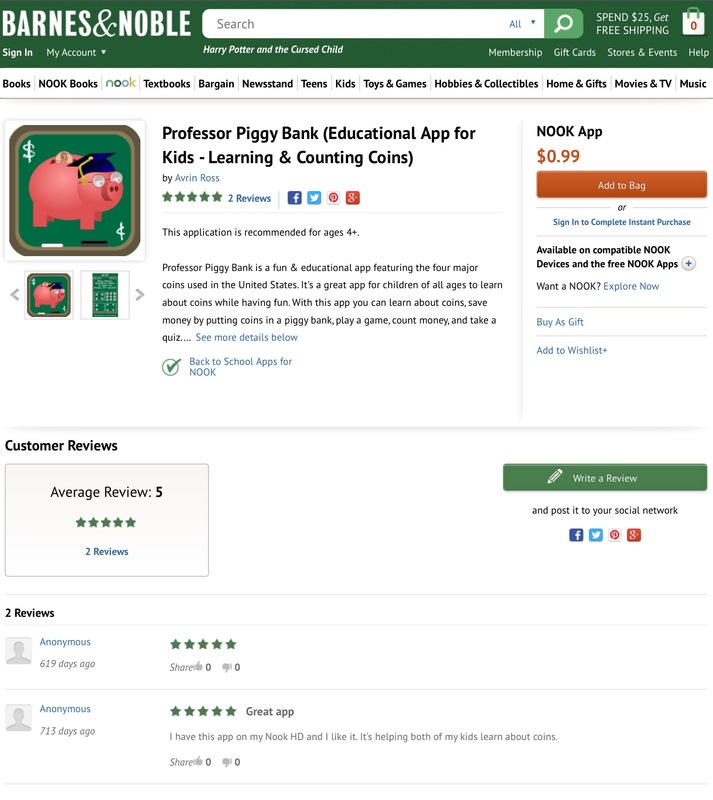 I’ll end this little goodbye post with some screenshots of my apps being featured, customer reviews, and my apps that were available at the time of this post on the Nook App Store. 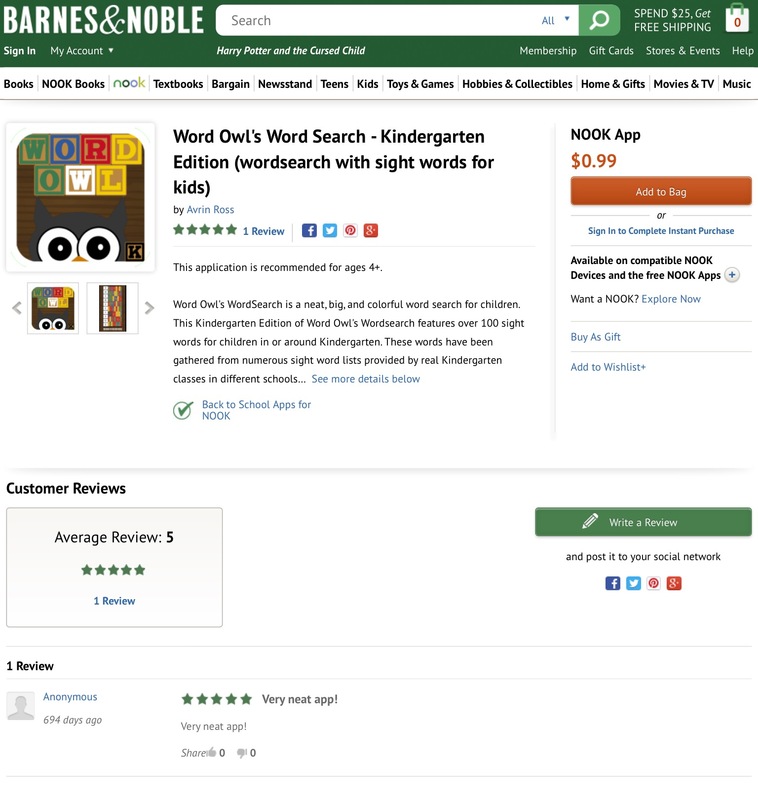 Farewell Barnes & Noble Nook App Store, and to all Nook tablet users, please look for and check out my apps on Google Play or any other app stores that you may have devices for like Apple, Amazon or Windows. Take care! My apps that were available as of March 2016. 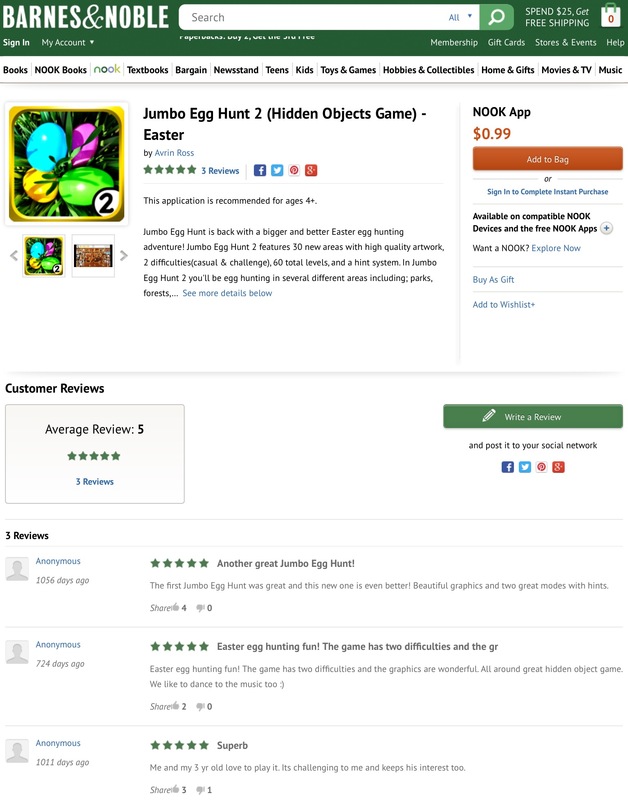 Jumbo Egg Hunt 2 was selected to be featured on the Season’s Best Apps promotional banner during the Easter season. Light Up The Tree & Gift Wrap Difference included in the Season’s Best Apps during the Christmas season. October started with a new app release on October 1st, and the rest of app dev work during the month went towards a new app that’s being released today(November 4th)! 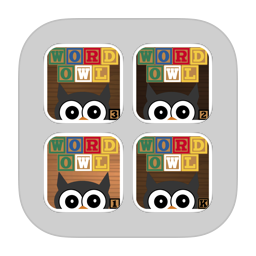 The first couple of days went towards promoting and enjoying the release of Word Owl’s Word Search: Halloween Edition. Then….because I’m a workaholic that set ambitious goals for the rest of the year….I went right into work on finishing RX Quiz of Pharmacy. 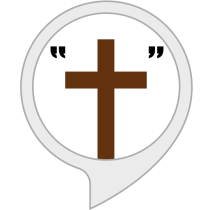 I finished several tables containing questions and answers in September so October development went towards implementation of that data into the actual app, design, testing & audio. After implementing the quiz data I jumped more into design, design, & more design. I decided to make the app basically look like a clipboard with pills on it but also have an overall clean bold look. So I made flat clipboard backgrounds and slightly raised buttons that looked like tablets. For the color of the tablet graphics I used colors from actual real life pill images online. After finishing those graphics I decided to make a statistics page that would store the number of questions answered, number answered correctly, and answered correct percentages. After the all the work mentioned above was finished, I went into the testing phase. After finding and fixing some of the data issues I went to work on the audio. For most of the audio on the app I recorded sound effects using actual pills and pill bottles. The button click sounds are the sounds of tablets dropping into a bottle. 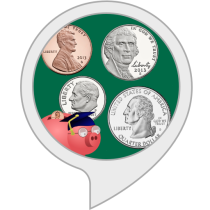 The Start Quiz button sound effect is the sound of a pill bottle opening with pills inside, and the sound heard after finishing a quiz is the sound of pouring pills on a table. I added minor effects to these sounds in GarageBand after recording them to make sound more bounteous. Then after finishing those sounds I also made basic correct & incorrect sound effects. I really wanted to make sure this app looked different from my Quiz of Medicine app, but also kind of pay homage to it because that app inspired me to make this app. 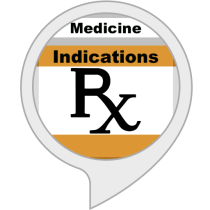 When I started working on Quiz of Medicine I thought I was going to make it more focused, but I went a little overboard with the medications and the app ended up turning into a massive quiz app featuring thousands of questions for over 400 medications. However, I definitely wasn’t disappointed with how that app turned out. I still think it’s a great app and it’s one of my best performing and well received apps with a lot of downloads and mostly positive reviews. My goal for RX Quiz of Pharmacy was for it to be more focused on pharmacy overall as a whole. I believe I succeeded with that goal by having it feature abbreviations, law, history, and only the top 200 drugs(in 2015 currently). I’m also really satisfied with the look of the app. I even smiled at the app icon for about a minute after finishing it. Working on an app icon is usually one of the final things I do during development, and that was also the case for this app. So I wasn’t just smiling because I really liked the look of the app icon, but also because it was a moment of culmination. June wasn’t as bountiful as May in app development land, but May was a month packed with working on an app, finishing that app, releasing it, and then working on another app immediately after. I also had a lot of non app dev work going on, however, I did make some nice progress with one of my new apps. 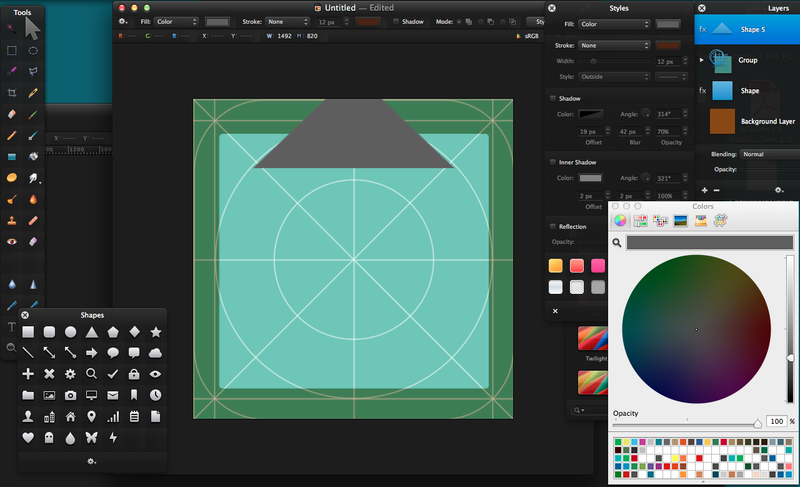 In June I continued working on the user interface on my new relaxation app. I decided to make the main features of the app the actual main menu/first screen so as soon as the app loads you can immediately go into a realm of relaxation. In the past couple of years I started to realize how important design is within apps and I’ve been intertwining development and design when possible. So instead of mainly developing/coding first or designing first, I often go back and forth between the two to see what looks and feels right. May was a busy month packed with putting the finishing touches on a game, testing it, releasing it, and then oddly working on a new app shortly after the release. Lets get into it…….. In May I finished and released my newest app, Crunchy Numbers Math Arcade. During the first part of the month I worked on the audio for the app which included main menu music, in-game music, and sound effects. At first I didn’t plan on having any in-game music, but when I finished the main menu music I wanted to keep making variations of it so I made small chunks of music to play during gameplay. However, I didn’t want the music to be distracting since retro chiptune themed music can sometimes be overly eccentric to some people so I made a rule that lowered the volume of music during gameplay. I also thought it would neat to have power-ups for when things are getting a little rough during gameplay. So after deciding what power-ups to create and making the art for them I implemented them with a rule that made a power-up randomly appear when certain conditions exist. There’s only three power-ups but they’re each different, and one of them is actually just for an extra life. I liked the idea of having a couple of power-ups, but I didn’t want the game to revolve around them, or for players to depend on them. To be good at this game you’ve got to have good reaction time, hand-eye coordination, and of course some math skills. Prior to final testing I implemented Game Center for iOS devices and Game Circle for Amazon devices and/or players that use Game Circle on other Android devices. High scores are a major part of the game so adding leaderboard functionality seemed like a natural thing to do. After finishing the game I did a lot of testing. I only discovered a couple of bugs and I was able to fix them in a day which was great. I always test my apps throughout development which makes the final testing process less hectic. I started working on my next app a few days after finishing the final marketing items(banners, trailer video, & etc) and releasing CNMA. Before release I thought I was going to take a small week or so break from development after release, but I wanted to jump into something new even though I was really satisfied with the way CNMA turned out. Crunchy Numbers Math Arcade is one of my favorite apps that I’ve developed, but I still felt a surge of energy to start working on a new app after it was released. Maybe I felt this energy because I was really satisfied with my recent release, regardless I definitely took advantage of it. The app that I started working on towards the end of May is a new relaxation app. I won’t go much into specific detail on it now, but it’s different from my Rest, Relax & Reflect app. I started working on the overall user interface design for this new app in May. Eventually I became satisfied with the color theme and button design, but I’m still testing different interfaces. I started working on the audio aspects of it last year so a lot of the audio of the app is complete, which is one of the main features of the app. I still have a lot work to do on the app which includes a lot of audio editing, various design aspects, audio implementation, and other development functions. I’m not sure when I’ll be finished with this app, but hopefully it will be sometime within the next couple of months. A little back story about Crunchy Numbers Math Arcade…….. I first came up with the idea of Crunchy Numbers Math Arcade during a retro themed game jam I joined last year. I went back and forth with a few ideas for a game, but once the idea of a math game with a retro look came into my mind I had an idea of roughly what I wanted to create. I knew I wanted it to have a player controlled item in a box confinement with the goal of going to the correct answers while avoiding enemies. After being satisfied with the actual gameplay idea I had to decide what kind of math I wanted the game to have. Eventually I reminisced about a really neat math game I played when I was a kid called Number Munchers. I didn’t want to make a clone of course, which wasn’t going to be the case because the gameplay was already different, but I decided to use some of the math lessons that were part of the game which included primes, factors, and multiples. I wanted the game to have four modes so after finishing the first three modes I decided to implement roman numerals. The first color theme of the game was mostly teal & gray with red enemies and white numbers. I wasn’t satisfied with the fact that there was no real theme to the game. Then one day while I was at Octane Coffee in Atlanta I started thinking about different color themes. I googled something like “different colors” or something similar and as I looked through the images I saw a set of dry erase markers and thought………it would be neat if I made the game have a dry erase board design but kept the retro chunky box design aspect of it the same. The colors I used in the game are meant to be similar to standard dry erase marker colors and then the standard board with the white surface, black text/numbers, gray boarders and black corners. Once I started creating the new graphics I became really satisfied with the overall look of the game and the remaining aspects of the game really started coming together more. The design decision gave me more confidence in the game itself and a boost of development energy that propelled me to work faster than the pace I was currently moving. Overall as I’ve stated above I’m really satisfied with how the game turned out and it’s become of my favorite apps that I’ve developed.